A common goal among many Americans today, especially young people, is to achieve financial freedom. In order to achieve this goal, it seems like everyone these days is going to college. In fact, Millennials are the most education generation in history and hold more advance degrees than any other generation. That’s great, right? For the majority of us, we didn’t get a free ride through college. As a consequence, the average college student graduates with between $20,000 to $50,000 in student debt, ouch! This tends to defeat the purpose of financial freedom, since we all know that you can’t be financially free if you have debt, not to mention all years you lose to generate income while studying, which is an opportunity cost. Like so many others, the day I graduated college was also the day I got stuck with a $23,000 bill for my student loans. The excitement of graduating and the celebration didn’t last long, as I quickly realized I now had less spending power than I did in college. To add insult to injury, finding a decent paying job after graduating college in your field of study proves to be difficult, if not impossible. After I graduated and received my degree, I searched for a job in my field of study for about eight months before I finally gave up and took a job with no relation to my degree whatsoever. In fact, the job I accepted didn’t require a college degree at all, and pays more too. Pretty ironic, huh? College also comes with an “opportunity cost”: The years you spend studying in college, are years you could have been working and investing. You may never see a return from your investment in education: If you never get a job for what you went to college for you’ll never see a return on the money and time college cost you. In other words, the costs of college, both financially and time spent, is bad for achieving financial freedom. Take it from me, someone who spent six-and-a-half years in college, holds two degrees, including a bachelors in finance, and a person who took a job that doesn’t require a college degree and pays more. 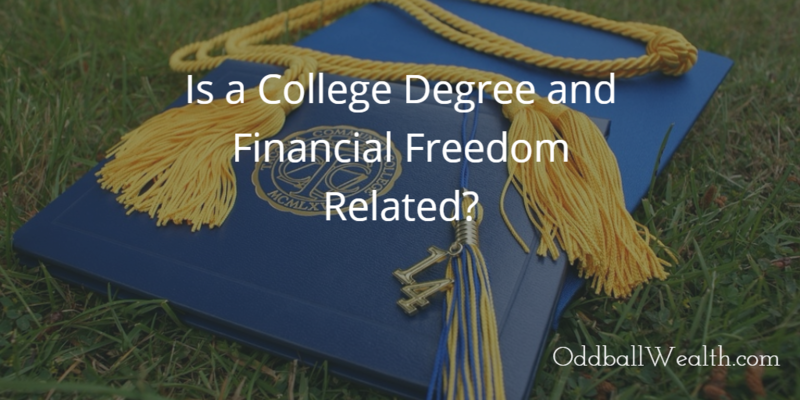 It doesn’t take an advanced degree to become financially free or find a decent paying job and career. When I finally graduated with my second degree, I needed to decide whether to continue onto graduate school and get my MBA, or, to just be done. I decided to call it quits. Now, almost two years later, I’m glad I did. Could You Be Better Off Financially Without Attending College? Although, I’ve been putting a lot of money towards my student loans every month, I presently still have thousands of dollars’ worth of student debt. I also have a good paying job, which doesn’t require in any sort of college degree. I can’t help but think about how much better off I would have been financially if I simply never attended college. I would have been able to begin a career and start working full-time straight after high school. I would have never had any student loans, and would have had 7-years’ worth of additional income and savings. I could have already saved enough money for down-payments on multiple investment properties. I could have had seven additional years to contribute to my Roth IRA and max it out each year. I also would have had more income and an earlier start for building my taxable portfolio’s. I already mentioned this earlier in this post, but I would have had around $23,000 less in student debt! My journey and road to financial freedom is still in the beginning stages, and my plan for getting there has very little to do with what I learned in college. The parties in college were fun, but the papers and final exams were stressful. To this day, I haven’t received any kind of financial return from either of my college degrees and probably never will. They only thing I’ve received from either of my degrees is financial burden and set back. Time and income are two of the biggest components for achieving financial freedom, and I lost almost seven years’ worth of time and income during my college career, while racking up a significant amount of debt in the process. In my opinion and in regards to gaining financial independence faster, I don’t believe a higher college education is worth the time or money it costs. The memories and experiences I received during my time in college, are however priceless. Although, if I knew then what I know now, I think I would have taken a different route.